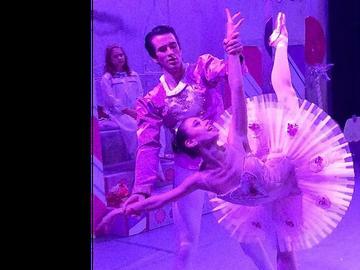 Join Clara and her Nutcracker Prince as they journey through this beloved holiday ballet performance with its magical growing Christmas tree, gently falling snowflakes, and dazzling performers in the Kingdom of Sweets. Our full-length ballet features the company dancers of the Collierville Ballet with professional guest artists performing the lead roles of the Snow Queen and Snow King and Sugar Plum Fairy and Cavalier. Enjoy the enchanting classical score by Tchaikovsky and share in the delight of this holiday classic and Collierville tradition with the Collierville Ballet. Important: Reserved Seating is only possible when connecting to TicketLeap through a desktop. Mobile app transactions will simply select the 'best available' seats - which may not be exactly what you want or need. It is therefore recommended to reserve your seats through a desktop/laptop computer using ticketleap.com in a web browser. Ticket Discount Levels: Reserved-seating tickets for individuals and groups. Discounted tickets are offered for children under the age of 12 and for group orders of ten (10) tickets or more purchased at one time. Volume Discount offered for groups of 20 or more when purchased at one time. Discounted tickets for seniors age 55+ and military personnel are available as well. Please contact us if you encounter any problems reserving tickets by calling 901-861-7001 or emailing us at info@colliervilleballet.org.